Lucinda Bunnen and Virginia Schenck are women who contribute to our fabric of cultural/social awareness. Lucinda is an ‘intrepid’ photographer and philanthropist who supports both artists and institutions around the globe. Virginia as a singer and vocal improvisation artist with three albums to her name. 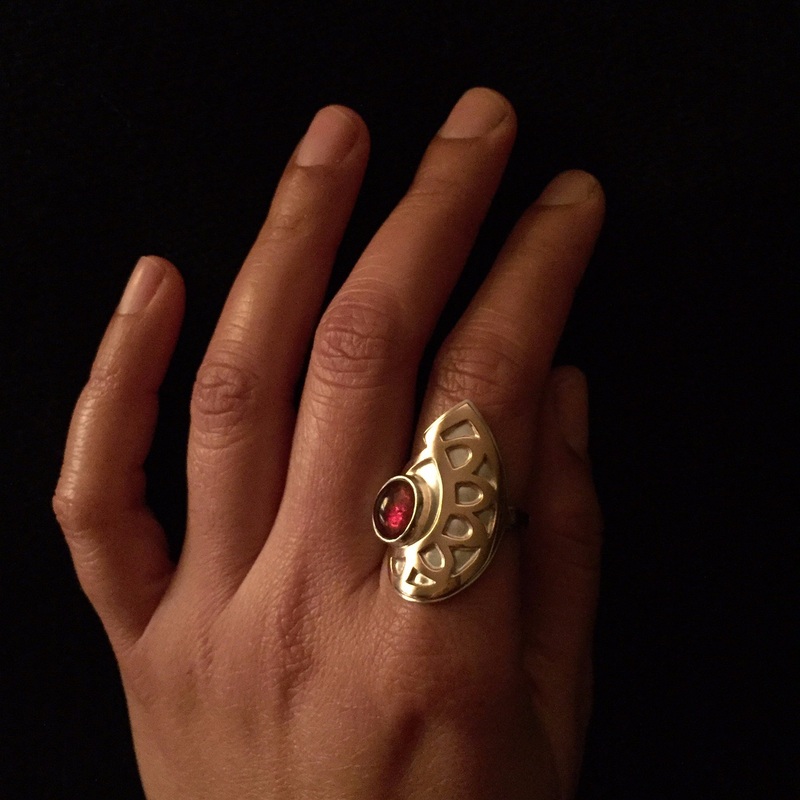 These women pump a dynamic signature on all that they touch and they wear talismans to empower their own energetic presence. I am honored that these Elaina Designs bracelets have become a part of their creative force for good in the world. 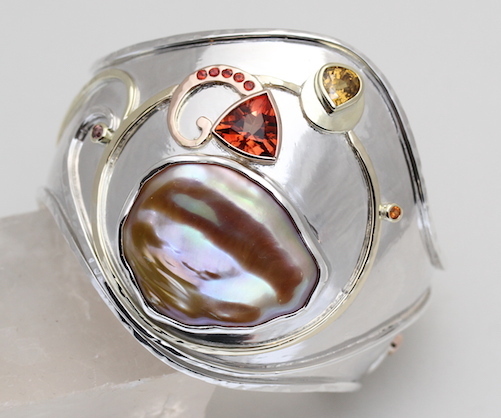 Sterling and 14K Bracelet with bronze natural color Puddle Pearl, Oregon Sunstone, Yellow Zircon, Ruby accents. 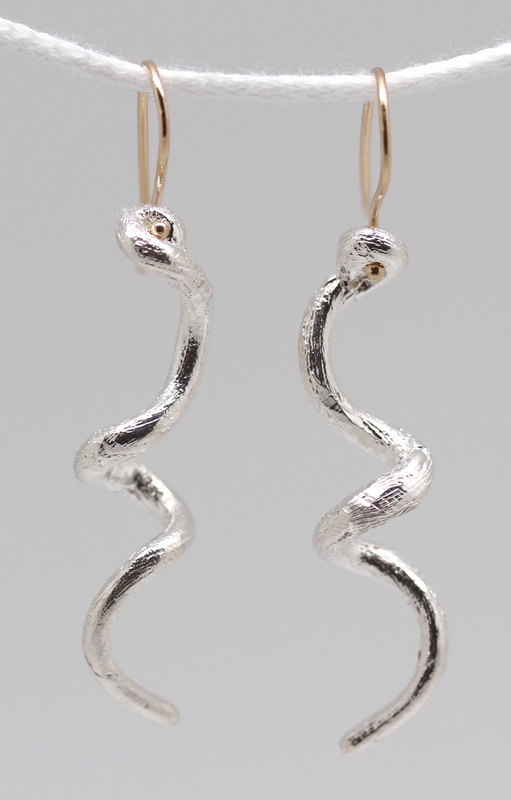 14kt Gold Snake hand forged and engraved, Indicolite eyes. In ancient text, Kundalini is a form of divine, feminine energy coiled at the base of our spine, often symbolized by the snake. Through spiritual practice, or as a result of profound life events, Kundalini uncoils upward, awakening one’s creative forces. Virginia had a dream about energy coiling up her arm into her throat, helping to send her voice out. She felt this as a potent sign of Kundalini Rising. She commissioned me to interpret her dream into reality. 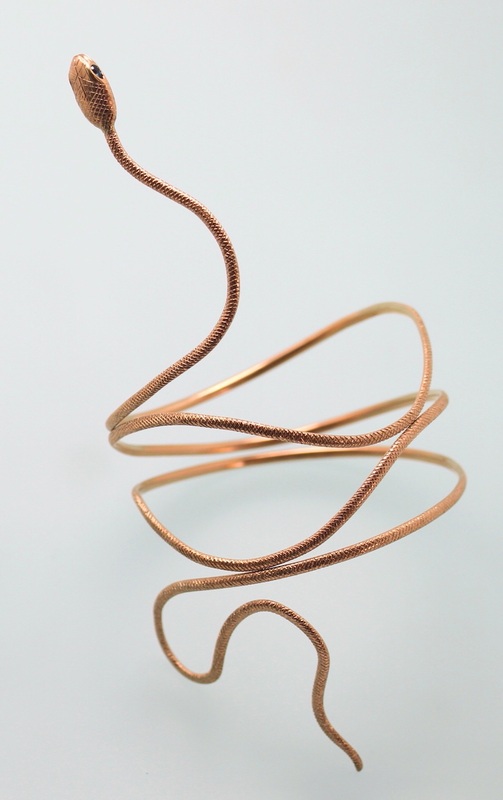 We had several fittings using a copper wire model, then solid 14K wire was used for the final design. I recently heard her perform at Fernbank Planetarium to celebrate the 2018 Winter Solstice. WOW! 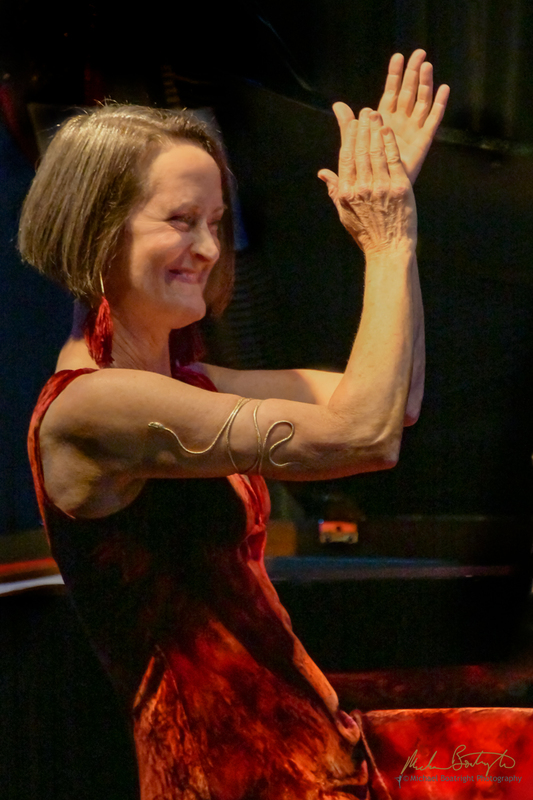 Check out her website www.virginiaschenck.com to find events for a keen and dynamic listening experience. 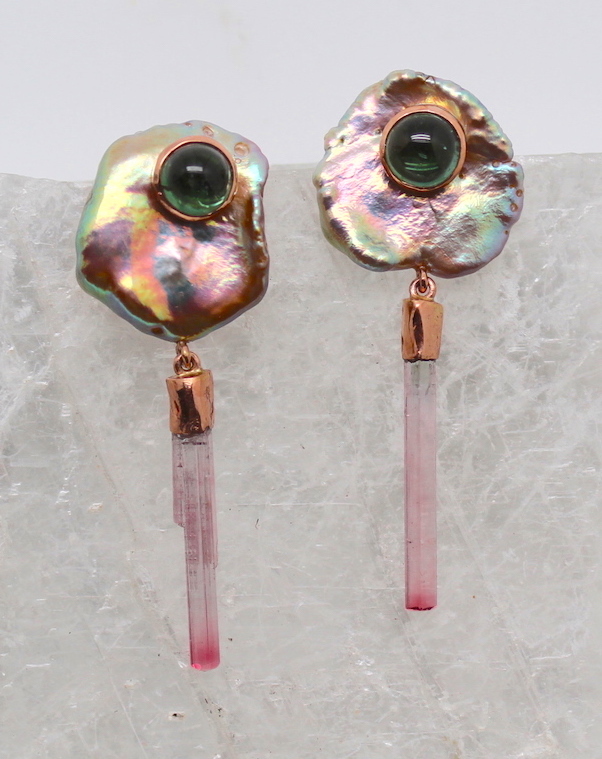 “Lotus Pond Reflection Earrings” Natural bronze color petal Pearls, green Tourmaline, bi-color Tourmaline crystals, 14K rose gold, $1490, by Lainey Papageorge. 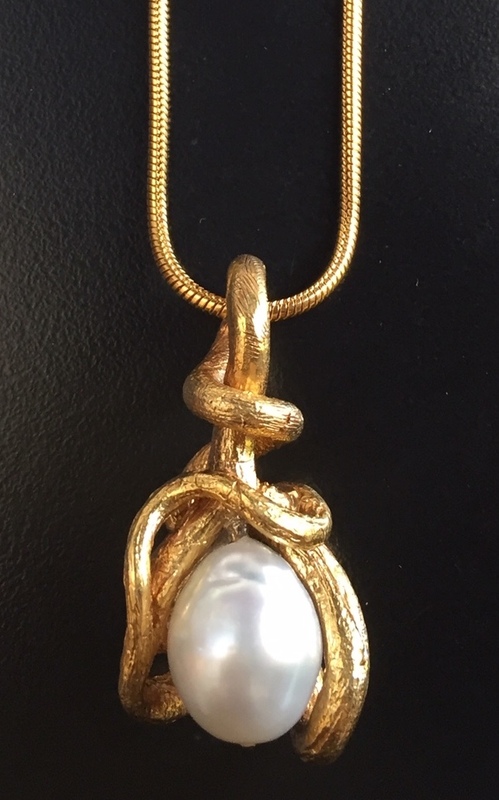 “Ouroboros Pendant”, gold plated sterling, white South Sea Pearl, $475, by Lainey Papageorge. 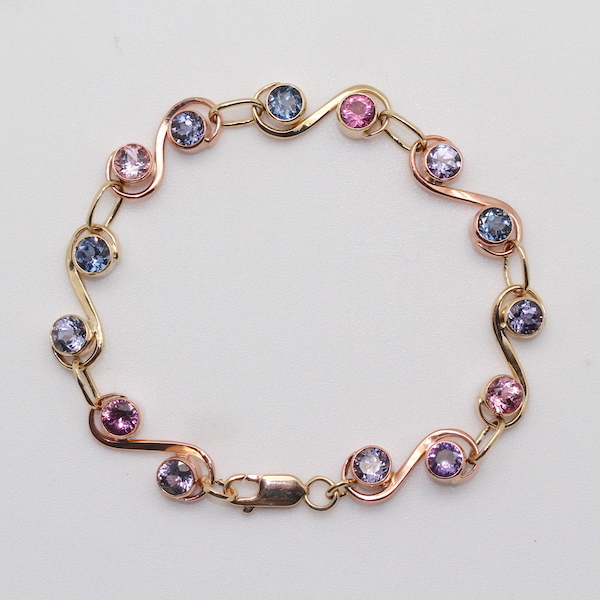 “Aegean Link Bracelet” with hand-forged links and rare natural color pink, blue and purple Spinels. 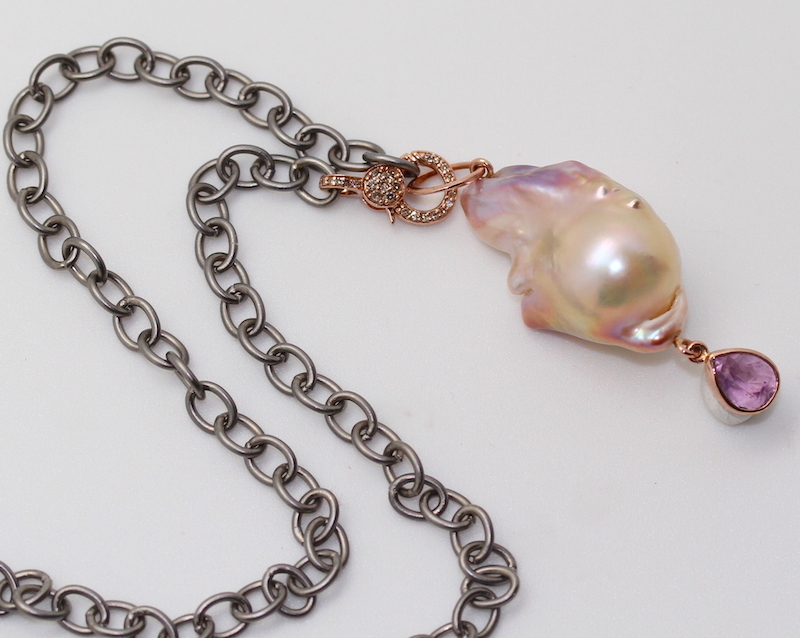 14K Yellow and Rose Gold, 7.25″ long. $3400, by Lainey Papageorge. Sometimes if we’re lucky and live long enough we get to see ourselves spiral around and revisit where we began. With fresh vision, our experiences lean toward wisdom. One spiral began in 1987 with the opening of Illumina Gallery in a tiny mall that now touches Piedmont Park, Midtown Atlanta. 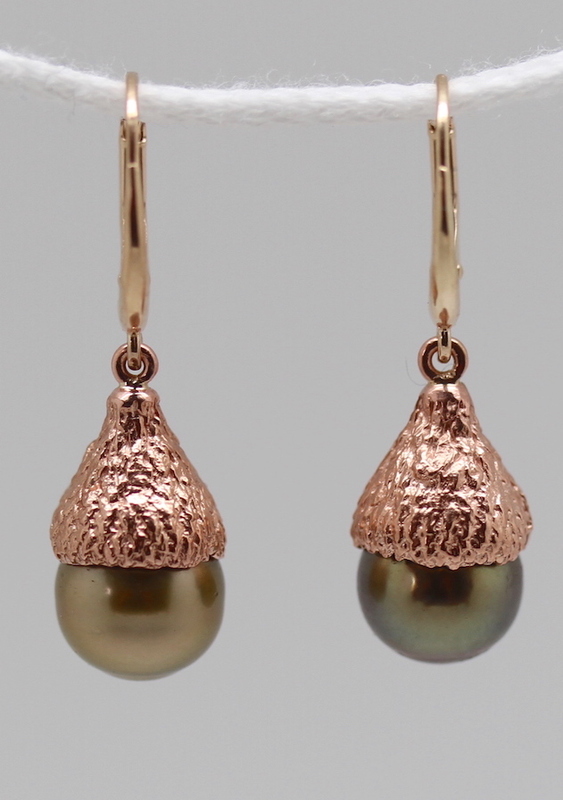 We sold art, mineral and crystal specimens, and sculptural fine jewelry from metalsmiths around the world. I remember finding this Rhodocrosite specimen from a South American dealer at the Tucson Gem and Mineral show 33 years ago. It was exquisite then and the story it now carries makes it even more precious. 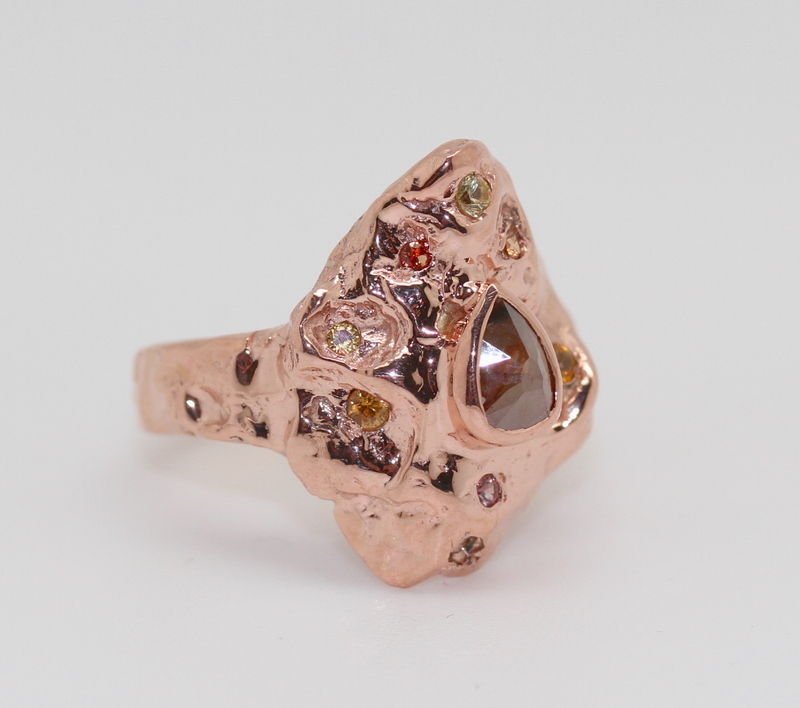 Repurposed heirloom Diamonds, rare Rhodocrosite specimen, 14K Rose Gold. Designed by Lainey Papageorge, articulation by FM Abdulky. 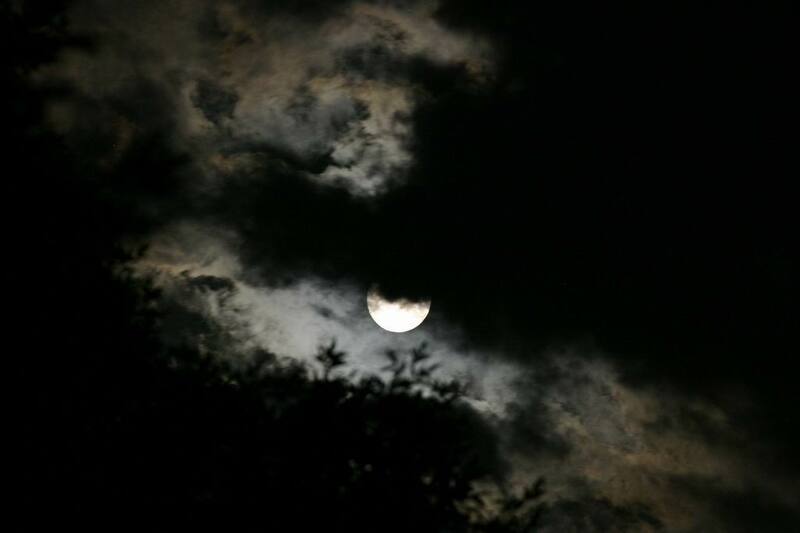 Obscured by thick clouds, the full moon was unseen yet felt. Wet, potent… something big had completed its cycle and new beginnings were astir. Same with me. Beauty is in the eye of the beholder…or felt in the subtle vibration. 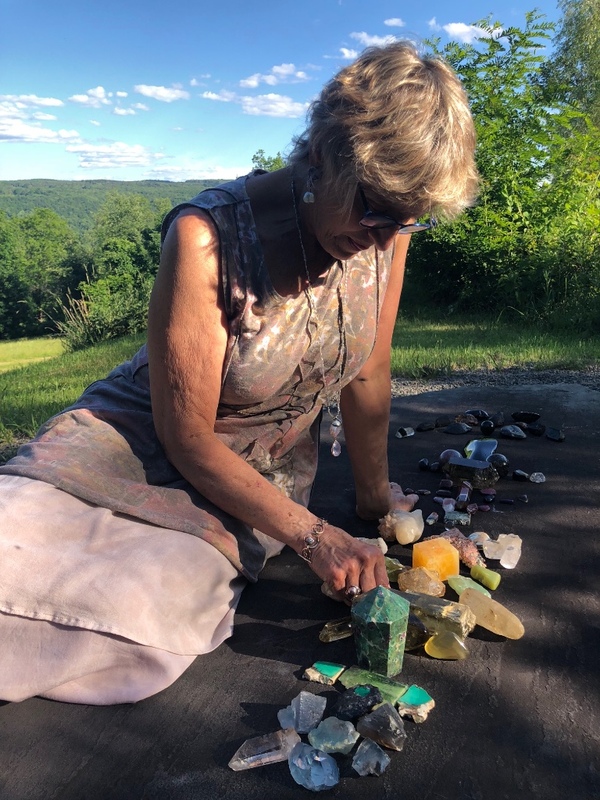 Private Gem Resonance sessions using my rare mineral collections in the Atlanta and Ithaca Jewel Rooms can now be scheduled by voice or text to 678-662-6156. $100/one hour, $140/1.5 hours. 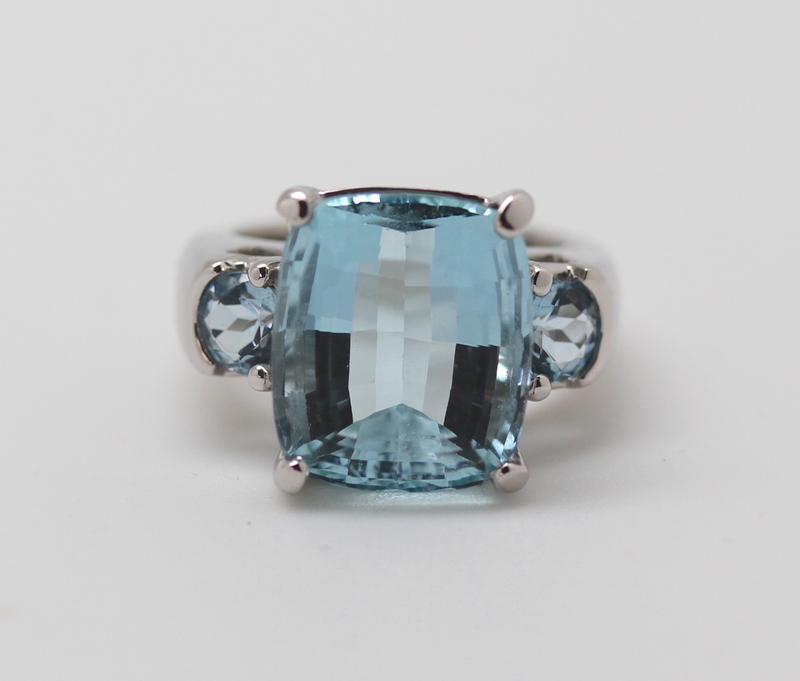 You can gift a session to another, or take a dive into the jewels yourself. In response to client requests I now have unusual minerals that can be purchased. Prices start at $2/specimen and if you wish, I will help you to create your own gem kit during a private session. 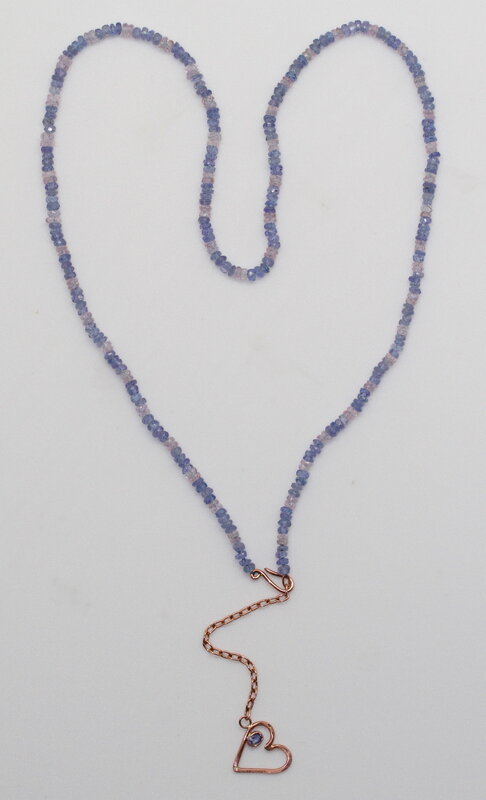 I’ve curated a Basic Gem Kit for $108, composed of 26 stones & crystals chosen for the various trace elements that stimulate and open pathways in the body. If you’d like to learn how to use the gem kits, sign up for a mini, introductory, 2-hour workshop for $60. Purchase of a gem kit is optional. Space for each workshop is limited, first come first served. If you are interested in reserving a spot, please respond to this email or text me with the date you desire. 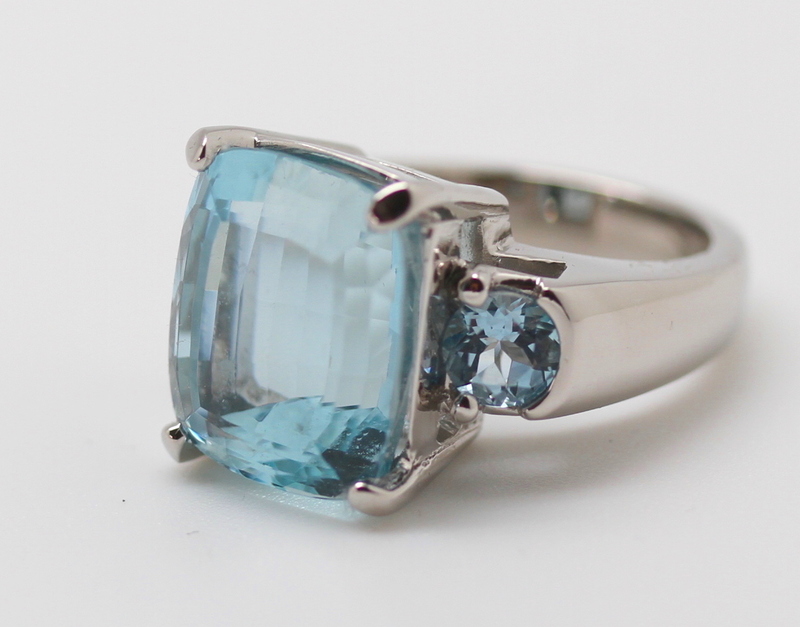 Make Your Gemstone Dreams Come True! Happy New Year, friends! 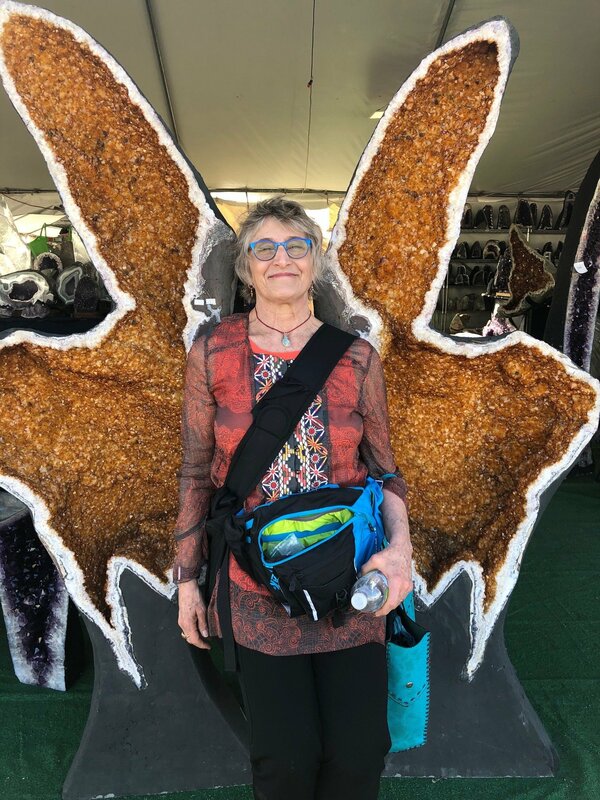 For me, each new year kicks off with preparing for the Tucson Gem and Mineral Show where the world of gemstones is at my fingertips in one place for a week. It’s thrilling to seek out the best quality pearls and colored gemstones from vendors across the globe and bring them back to my Atlanta and Ithaca studios. If you’ve been daydreaming about a unique gemstone or a particular type of pearl with which you’d like to decorate yourself, let me know! I’ll be in Tucson January 31 – February 6. These recent jobs incorporate gemstones and pearls sourced at Tucson, one-on-one custom design, and my eco-friendly design approach — repurposing old jewelry. Many thanks to those who supported and purchased from Elaina Designs in 2018. I feel blessed to have worked with each of you to create beauty that is more than the sum of its elements. 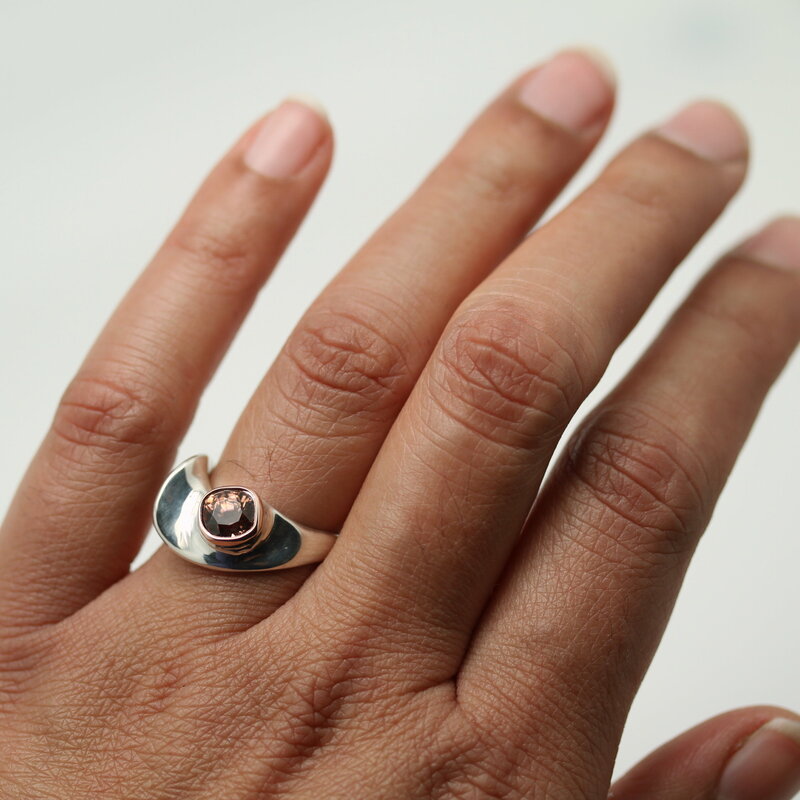 Oyster Engagement Ring for Jeffrey and Amelia! 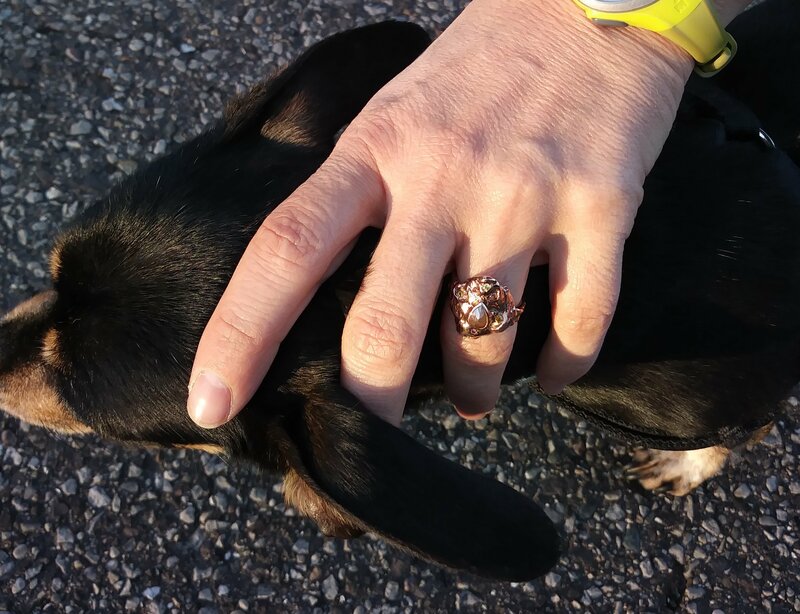 Last year, I received a call from the West Coast with a unique and fascinating request for an engagement ring. I knew Jeffrey Blumenthal as a young boy because he was classmates with my son at Paideia and I became a close friend of his mother, Janet. 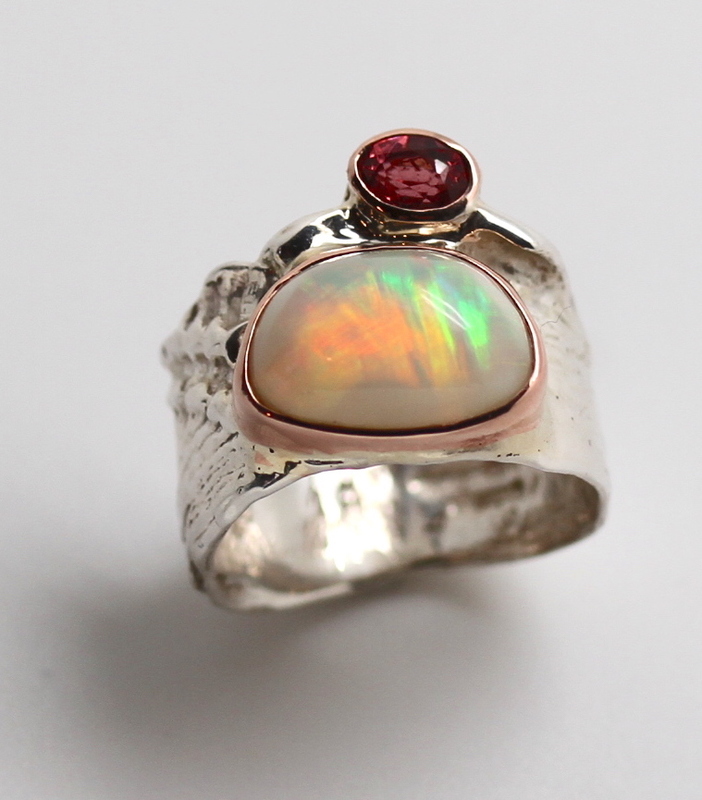 Jeffrey wanted a ring using an oyster shell he had collected during his research in San Francisco Bay. 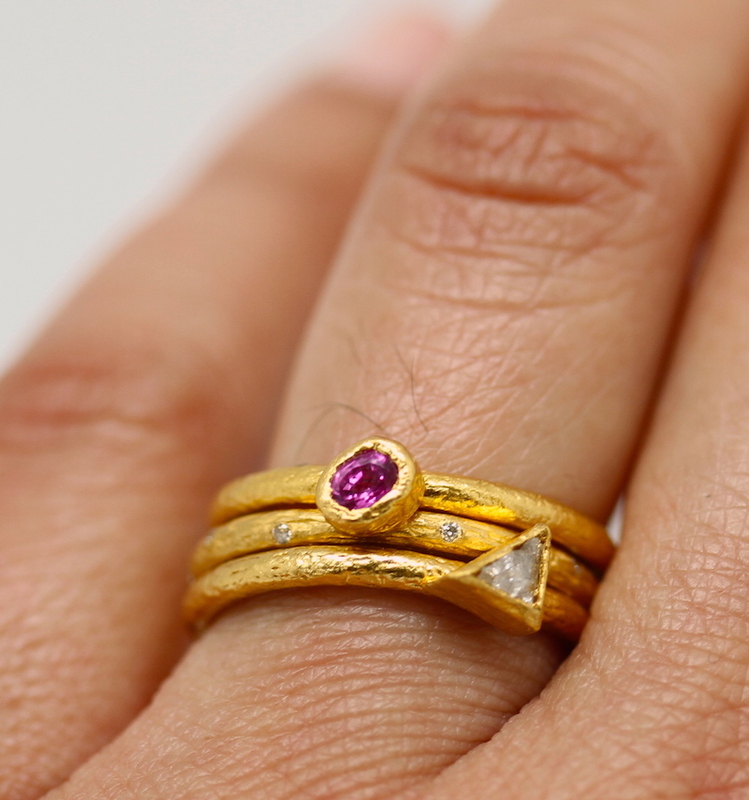 During the design and fabrication process of this unique ring, I learned so much about the important work that Jeffrey and his fiancée, Amelia, do. Jeffrey is building a habitat model for the Atlantic oyster drill, an invasive predatory snail in SF Bay that feeds on oysters, barnacles, clams, and other hard-shelled invertebrates. The ultimate goal is to recover the wild Olympia oyster population. He gathers data to better understand these animals’ habitat requirements. Once it is understood how these animals fit into their environment, he and his team can design projects that support the oysters without feeding the snails. Big picture, he is learning how to adapt and prepare our urbanized coastline for climate change while supporting local biodiversity in ways that are mutually beneficial. Amelia works as a Ringside Geologist on a geothermal energy development project in the Fiale Caldera region of Djibouti, Africa. She inspects samples from drilling bores to determine geothermal potential and feasibility. Harnessing geothermal energy reduces our dependence on fossil fuels and nuclear energy, thereby reducing our carbon footprint. It was an honor to design this ring using fair-trade gemstones and sustainably-mined rose gold for this conscientious, hard-working couple. 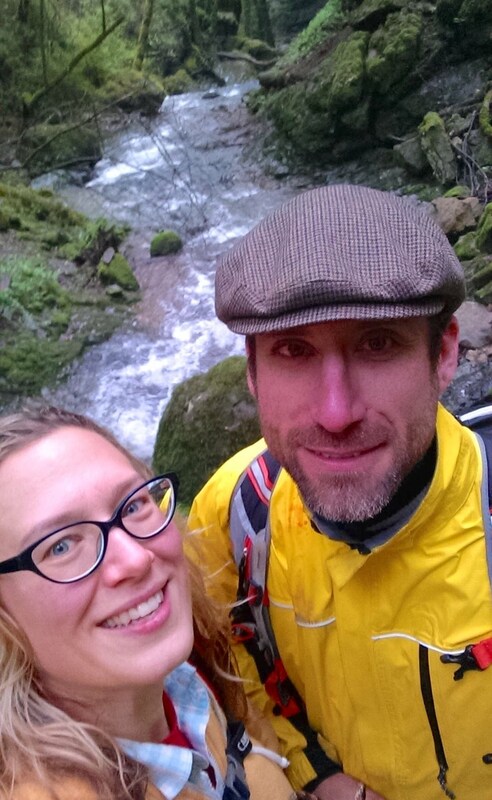 Thank you and congratulations to Jeffrey and Amelia! High Museum of Art Pendants Available for Purchase! 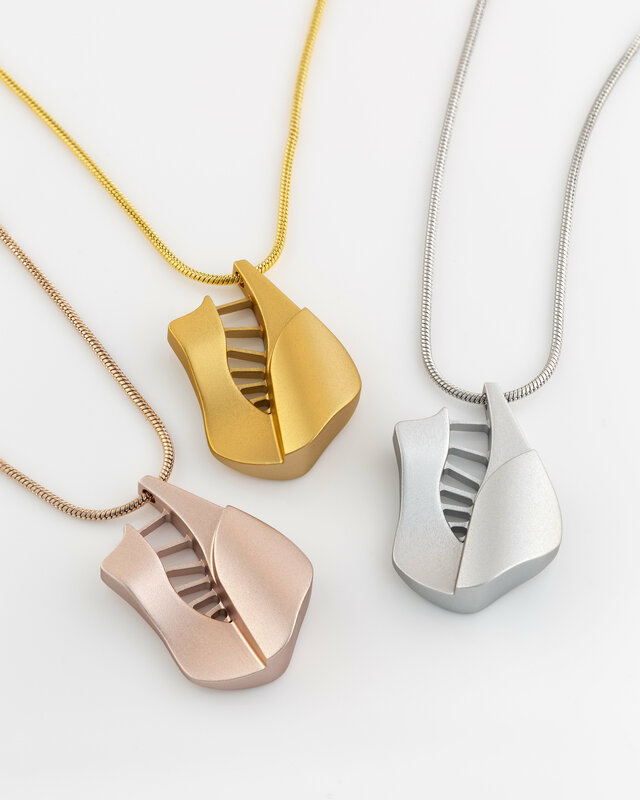 Fourteen months of sketches and production research resulted in this sleek, sculptural aluminum pendant commemorating Atlanta’s High Museum of Art. 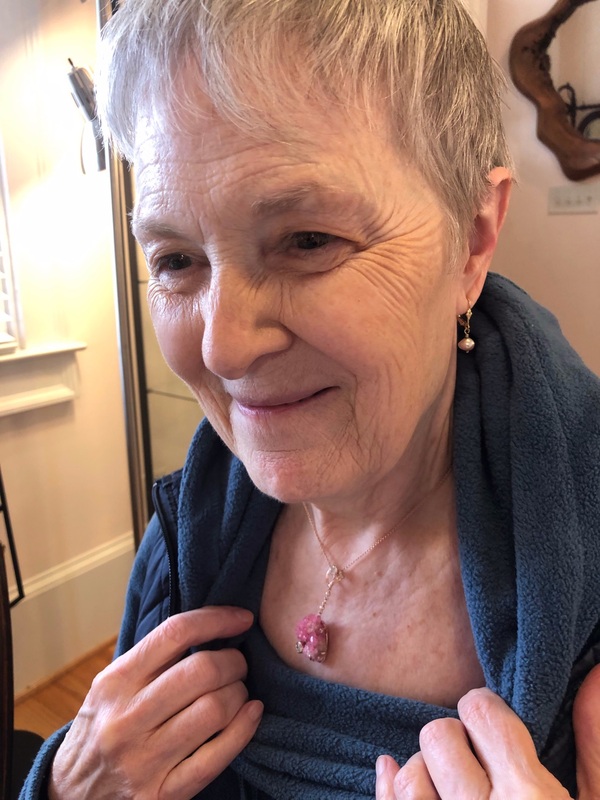 The process began in 2017 when Lucinda Bunnen, my friend and patron of the arts, encouraged me to approach the High to advocate for better representation of local artists in their Gift Shop. 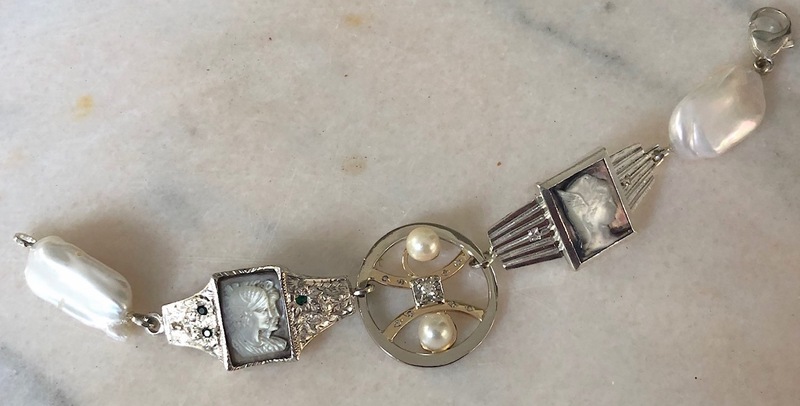 What evolved was a commission to design a specific piece of jewelry celebrating the High, with plans to present it at the 2018 reopening of the museum’s newly redesigned permanent collection galleries. 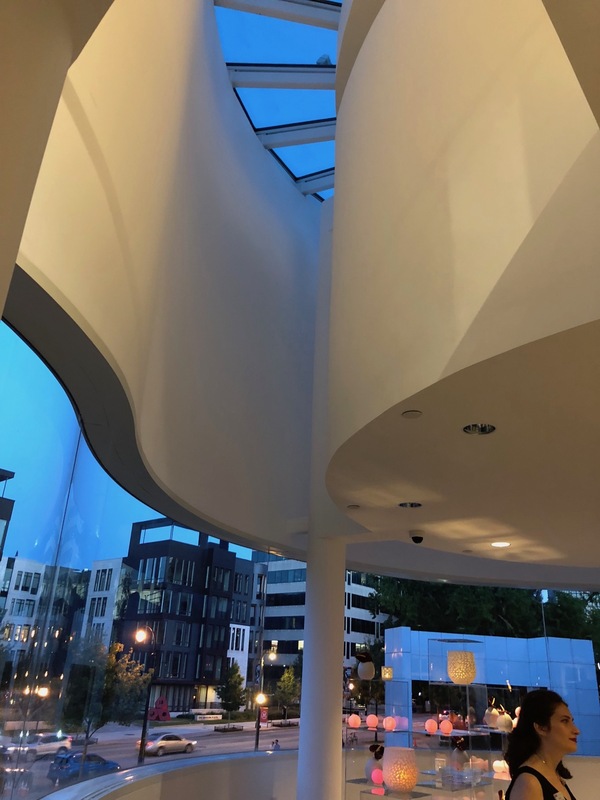 I initiated the design process with photos of a ceiling feature from the High Museum’s Stent Family Wing Atrium designed by architect Richard Meier. Striving for the most precisely pleasing curvature, I employed CAD (Computer Aided Design) and 3D printing technology to develop the final form. Many attempts were made to achieve crisp edges, a convex back, and a finish that would be stable, consistent, and comfortable to touch and wear. When I was satisfied with the aluminum prototype, it was presented to the Director of the High, Rand Suffolk, the Board of Directors, and Sylvia Roberts, Gift Shop manager, for final approval. 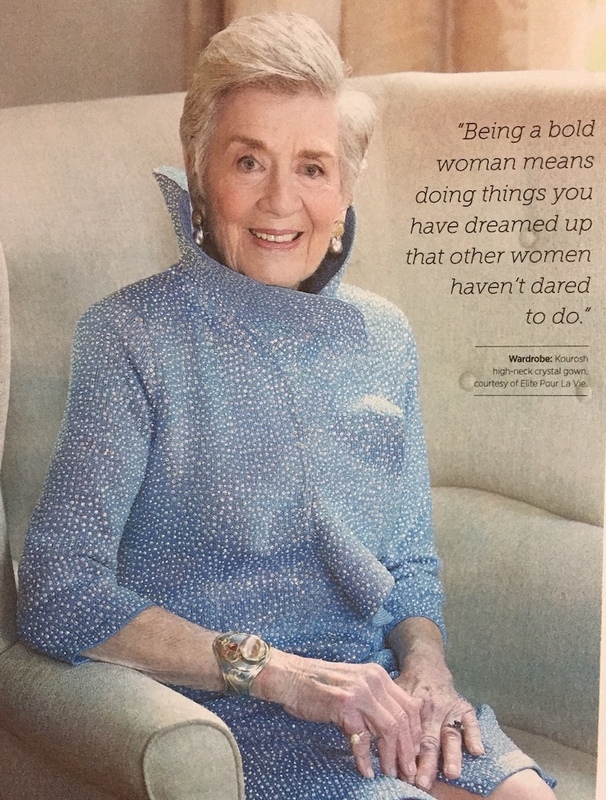 At the High Museum of Art Gala that opened the new renovation in October 2018, Monica Pearson, former Anchorwoman at NBC and the Master of Ceremony, wore the necklace, told its story, and introduced me to the attendees. I was both humbled and proud to receive this recognition. As artists, our life experiences train our eye and inform our work. 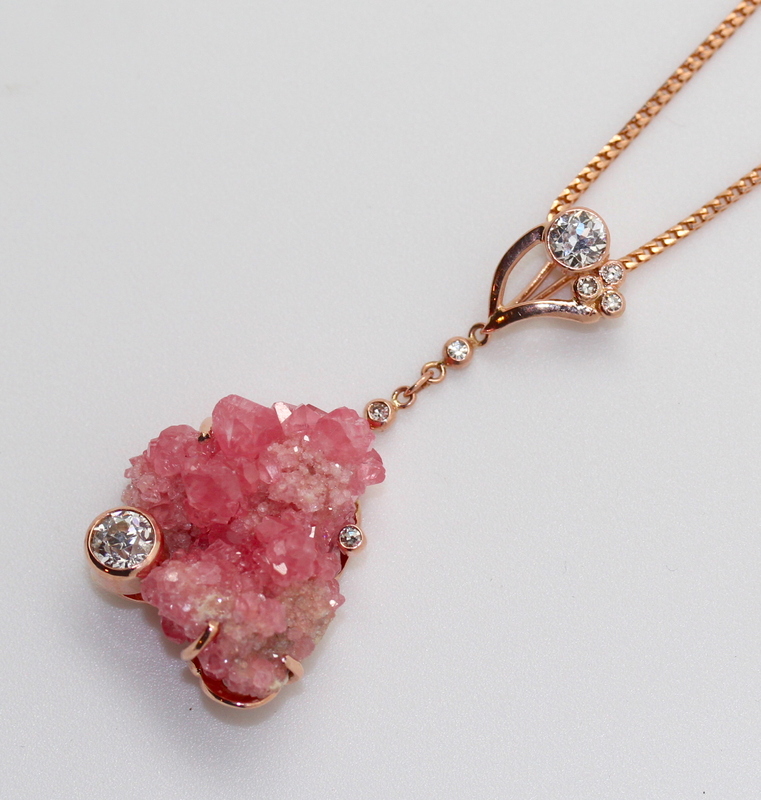 Creating this pendant was no exception. At 13, my mother took me to the groundbreaking ceremony for the High Museum of Art and I dug up red clay with a shovel where the museum now stands. My roots as an artist in Atlanta go deep. 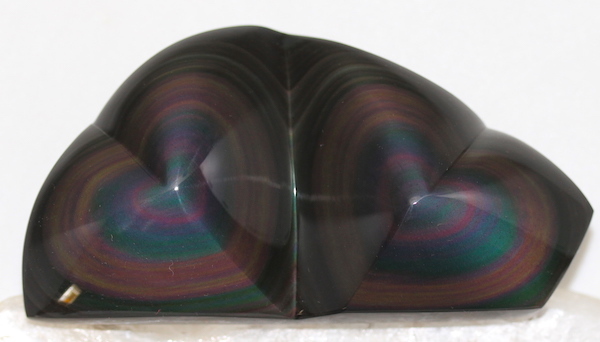 During my 20’s, I lived and produced jewelry in SE Alaska, often flying in a small plane over the expansive landscape, struck by its glacially carved features. Now, in my late 60’s, Meier’s architectural forms fuse with my aesthetic biography to create this contemporary talisman. 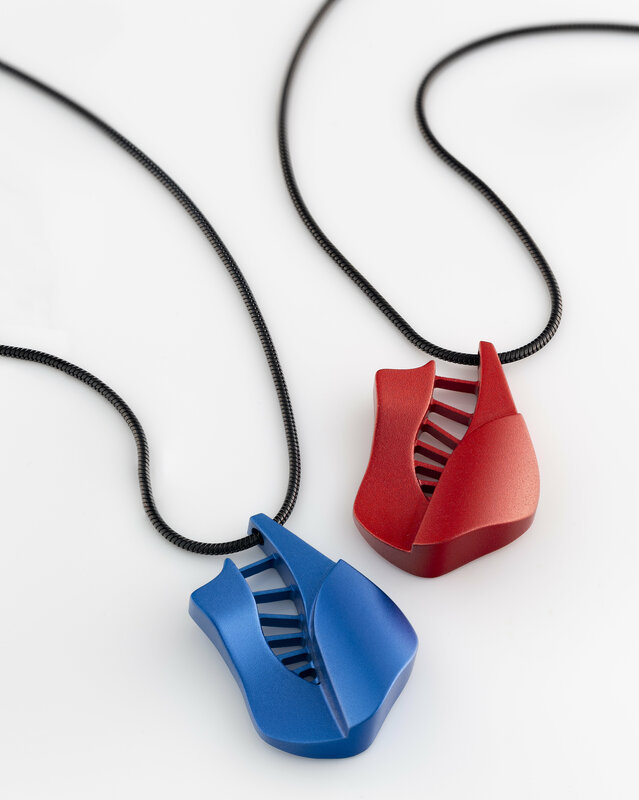 These pendants are available for purchase exclusively through the High Museum of Art Gift Shop, on my website, and in my showroom. 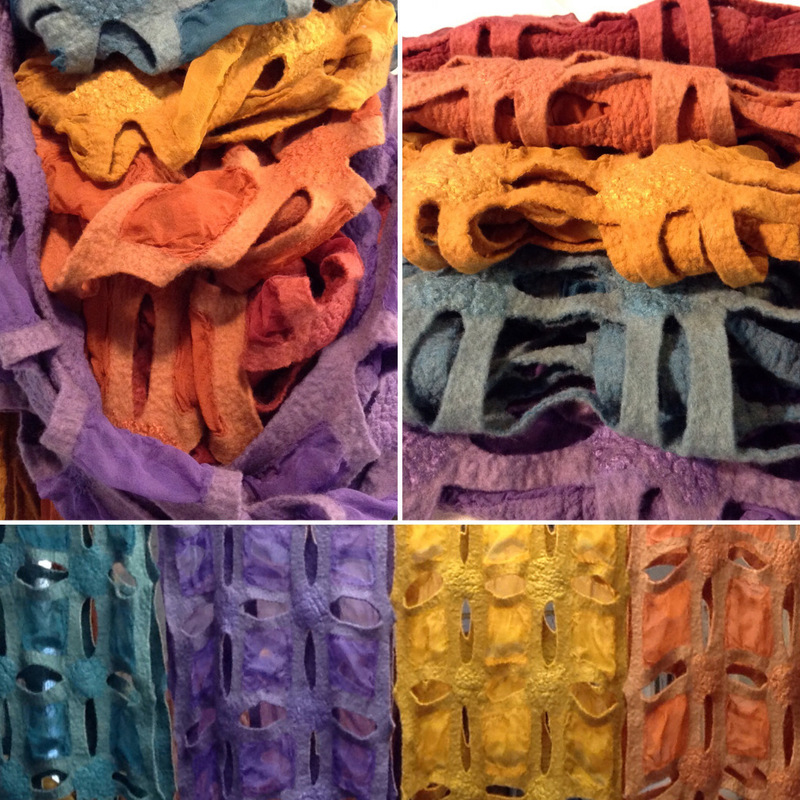 These would make a great Holiday and year-round gift for any art lover. Free gift wrapping & shipping for purchases made through our website until December 17. Free Domestic Shipping on Website Purchases! The Holiday Season began with a great turnout for our Open Studio Sale last weekend. Thank you to all those who were able to come and buy. 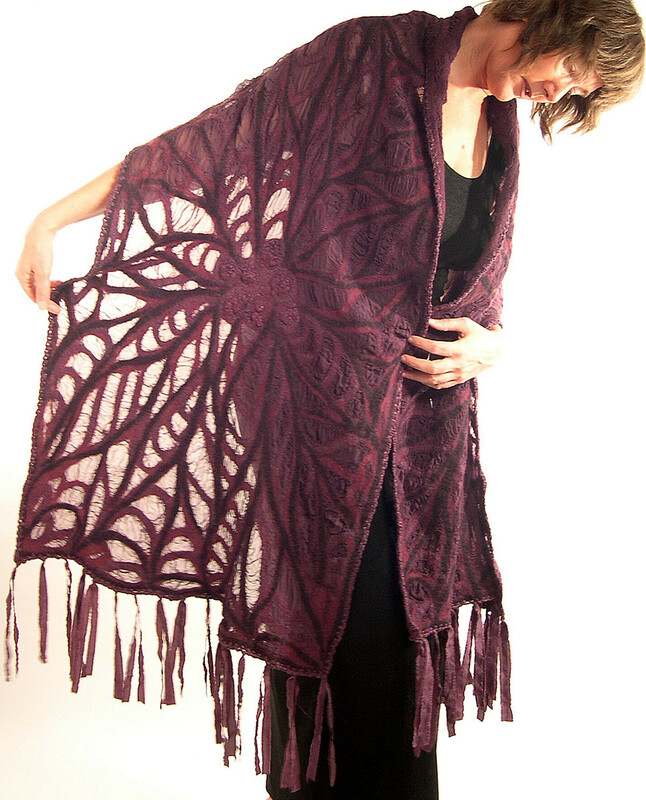 Until December 17 we are offering free gift wrapping and free domestic shipping for all purchases made through our website www.elainadesigns.com. There is still a great range of handmade and unique artisan jewelry pieces in all price points. If you need extra help in picking out the perfect gift, you can visit Lainey at her Kirkwood Atlanta home studio through December 26 or call for an over-the-phone gift consultation (678) 662-6156. Tuesday, Thursday and weekends by appointment. 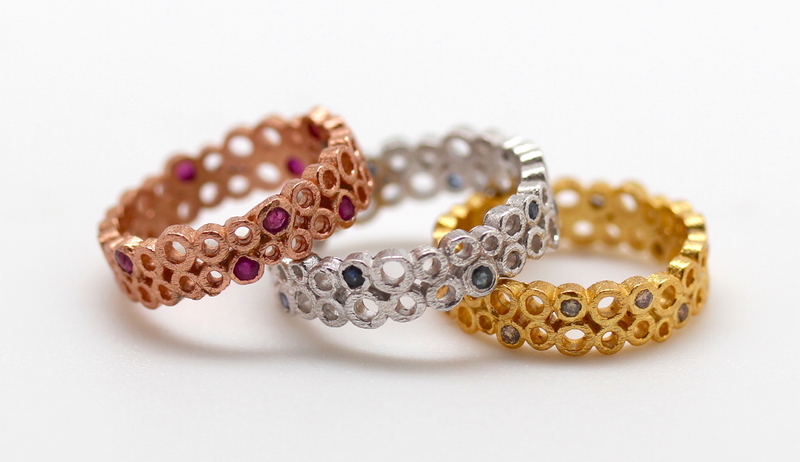 Elaina Designs: Match-making people with jewelry! 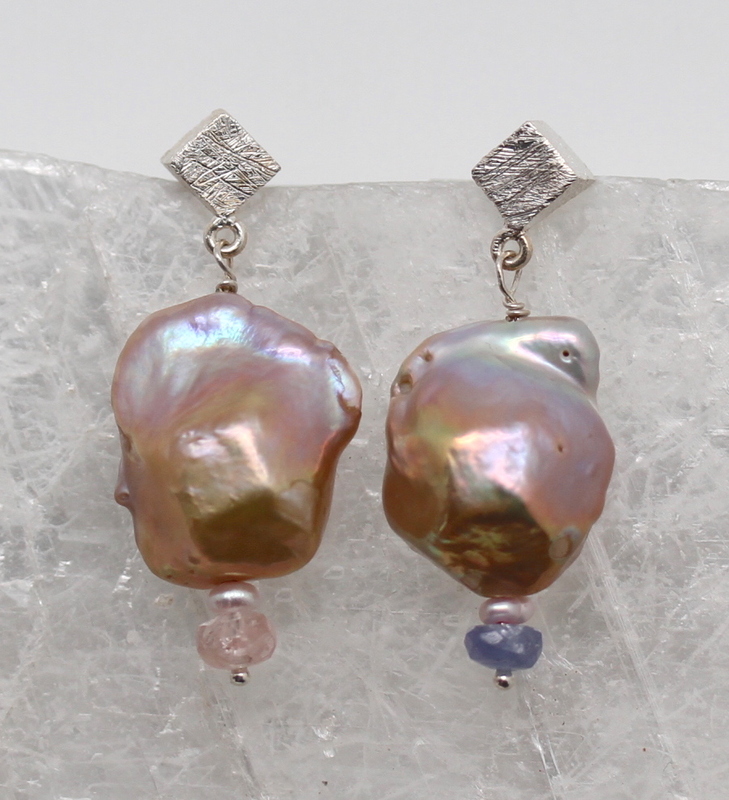 Bronze/Pink Pearl, Sunstone, Tanzanite, Sterling Cube Post Earrings, $175. 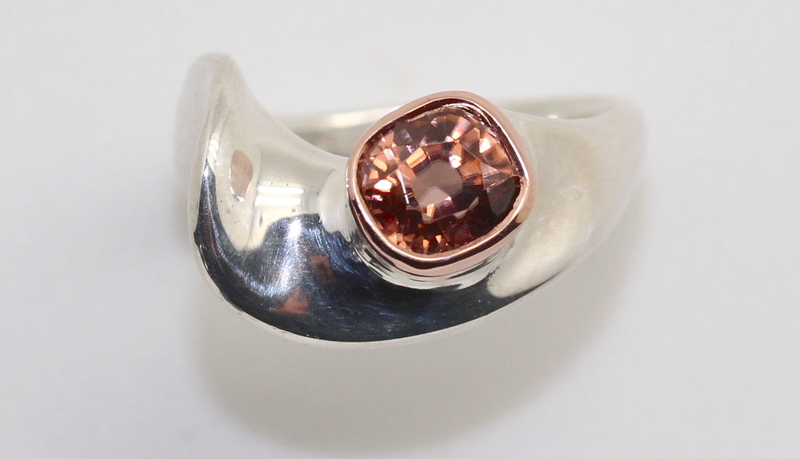 Chocolate Zircon with 14KP bezel, sterling Baja Ring, size 6.5 $450.